Byrd Billings and Melanie Billings were found murdered in their Florida home. The Billings were parents to 16 children, 12 of them adopted. See photos below. See updates and new video below. This initial post is my "master" post. I will always update this post first, and links to every post can be found here. Latest update 8-22-09 10-4-09 10-25-09. The Billings rural, 9 bedroom home was the victim of a home evasion with forced entry on July 9th, according to police. The couple was found shot to death in their bedroom in Beulah, FL, near Pensacola. Those children who were home at the time were found safe, some still sleeping. Reports are that the home had a security system with sensors and cameras in every room, and the driveway is monitored as well. Thirty days of footage from every camera is continually stored. Neighbors reported a full-sized red van with three white males seen leaving the Billings home. ...among them, children of drug users, children who were sexually abused and children with developmental disabilities. Six of the 12 have Down syndrome. Two have died. Each of the Billings brought two children to their marriage. Melanie has two daughters, one with cerebral palsy and autism. Her oldest daughter now runs the family business. Byrd had two sons at the time of marriage. They had full-time help, Monday through Friday. The older children have their own room, with the younger kids sharing a suite. All the girls sleep downstairs and all the boys sleep upstairs. Nancy Markham is the mother-in-law of one of the couple's grown children. She spoke of the Billings as "very good people." Photos from 2005 courtesy of Pensacola News Journal. One arrest in the Billings murders has just been reported. A 56-year old man is in jail and charged with attempting to paint over and hide damage on a red van that was caught on surveillance cameras on the property. Gonzalez did not own the van, according to police. His bond is set at $250,000.00. "Tips from the public led police to the van. The police they are looking for "multiple persons of interest." On Sunday, Morgan pledged to find those responsible for the killing. "This investigation will expand much larger than anyone had anticipated," he said. "I can promise you in coming days we will have many more arrests." The police are confirming that three men killed the Billings. One of the children in the house at the time of the murder called a neighbor who called the police. No other information is available about the child. See this update on the arrest of three people for the murders of the Billings. WKRG.com reports that court documents show that Byrd and Melanie Billings "took in" an adult son's daughter, their granddaughter, in 2006. They sued him for child support in 2008, and asked for a $50,000.00 life insurance policy for the girl, who was 18-years-old at the time, with themselves as the beneficiaries. The black briefcase missing from the Billings home was found today, according to Escambia County investigators. According to this report, "nothing of substantial value" was found. Sheriff Morgan did not say where the briefcase was found. FOX10tv.com is reporting that Byrd Billings "helped finance a martial arts studio" for Leonard Patrick Gonzalez, Jr. The information was found in a warranted search of the van considered the get-away van. It is not clear which "martial arts" studio this refers to. Gonzalez, Jr., had a non-profit business known as FIGHTBack. 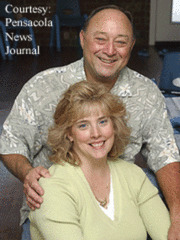 His mother and stepfather, Terri and Joe Poff have owned Poff Taekwondo for many years. A suspect in the Byrd and Melanie Billings murders has reportedly told police that Leonard Patrick Gonzalez, Jr. was the sole shooter in the killings. It appears from that report that it may have been 19-year-old Frederick Thornton who gave the police the information, but it is not entirely clear that the report came from Thornton. Thornton told police that after the murders all the suspects met up at the Magnolia Antique Mall, owned by "Pam" (Pamela Wiggins). Thornton said the safe taken from the Billings home was driven in the get-away van to Wiggins' red minivan. Wayne Coldiron, also under arrest for the murders named "Pam" as the driver of a maroon minivan. Frederick Thornton and Gary Sumner, also under arrest, then got into Sumner's blue SUV and drove to Wiggins' antique mall for the meeting. An adopted 10 year old son with Down syndrome was in the bedroom of Byrd and Melanie Billings when masked gunmen entered the room and shot his parents. The documents released yesterday state that Justin Billings, the 20 year old son of Byrd and Melanie gave police information the day after the murders. Justin is being linked in some ways with Patrick Poff Gonzalez, Jr. In another statement released in the documents, investigators interviewed Justin Billings, Byrd and Melanie Billings' 20 year old son. The day after his parents were killed, Justin Billings told investigators he believed his parents' murders were contract killings, and he pointed his finger at a gang from Colorado. "One of my friends from Colorado. He has, he has a rat that's part of a gang," Justin told investigators. "He said there was a hit in Florida that fit the description that I gave him." The mother of Justin Billings' ex-girlfriend told detectives the 20 year old told her he paid someone $3,000 to protect her daughter, which Justin denied. "I didn't pay anyone," he said. "Then why would you say something like that," the detective asked. "To give her closure," Justin replied. During the interview, investigators clearly became frustrated at one point saying "Bulls*** Justin. Justin, that's not gonna fly." Justin Billings told investigators he believed the one person who would want his dad dead was Cab Tice. Tice, who Justin described as a former business partner who sold cars with his dad "down to Mexico", was arrested August 6 and charged with stealing thousands of dollars from one of Byrd Billings' businesses. Tice was named a person of interest, but he has not been charged in the murders. About the children in the home at the time of the murders (the "W" beside each name indicates "witness:"
Guy: How did ya'll wind up meeting Pamela Long, tell how that relationship come about? Guy: ...So, so Pat knew Hugh? Tabatha says Pamela's daughter is 13 years old. She also says she has helped Pamela rent out properties - "she has a place on the beach and the houses and I help clean them and rent them out...I've painted...." She talks about the self-defense business she and her husband had...said they no longer had a studio due to the economy...said they had to borrow some money to get into the building in the beginning. She mentions a name: Steve Manatat - a student of Patrick's. She said Cab Tice loaned them money (Tice is now under arrest - see links below). Guy asked: "did Pat ever talk about about Mr. Billings? She says that "Cab" introduced them, and said Billings donated $5,000 to the couple's Project Fight Back non-profit business. She said Billings wanted to help invest in the business. Tabitha says "Jerry Wood invested in the school." ...he was a friend...at one time a student but mainly a friend. She says she met Billing once, was never at his house. She indicated she and her husband are friends with the "Manatats." She talks more about Hugh Wiggins: She says "a lot of times he was in school," but came home to work on a boat and was home for 2 weeks out of the month. She said her husband, Patrick hung out at Pam's house. Tabitha said Pam's boat was in Patrick's name because Pam was afraid it would be repossessed. She said Pam wanted Patrick to see to that her daughter was taken care of if anything happened to her. Tabitha said she did not want her name on the boat. Tabitha indicated that she has a lot of Pam's rental business records for the beach house on her own computer. On the day of the murders, Guy asks her to recount her day. Patrick was known to be in a Wal-Mart with two black males that day and was seen on video with them. Tabitha said she met her husband inside the store but did not see the two black males. Investigator Guy says Patrick is even holding one of their children, in the company of the two black males at the check-out. She continues to deny that she knew her husband has these two men with him Wal-Mart. Guy asks her about Pamela's son Casey...says he is about 20 years old...has a "little baby," indicates her husband knew Casey well. They talk about Hugh Wiggins' cream or white van. She knew the white van. She said she has known Hugh for 1-1/2 years. Tabitha Gonzalez says she has a prior 10-year marriage to Brandon Fausti. Another man in the auto industry, who knew Bud Billings, says Patrick Gonzalez, Jr. tried to kill him. Mark Turner said it was a "hit," possibly from one of the biggest auto dealers. Hugh Wiggins, the husband of bigamist Pamela Long Wiggins has been named a suspect of interest by Escambia Country Sheriff David Morgan. As it turns out, Hugh knew the suspected triggerman, Patrick Gonzalez long before Pam Long knew him. Hugh Wiggins had numerous meetings with people involved in the murders, some at his own home. One witness said that Hugh threatened him. Read the story here. "Cab" Tice reportedly told authorities that Patrick Gonzalez, Jr. was like a son to him, and then clarified that it was "like the wayward child that you always want to try to be a good influence on his life." Patrick Gonzalez told authorities that Cab Tice asked him to "whack" Bud Billings. It gets more appalling every day. Tice said that his Hispanic American Auto Sales business was failing and he borrowed $20,000 from an employee, who in returned borrowed money to give to Tice from the Mexican Mafia. Tice claims he was unaware the funds came from the Mafia source. Tice owned Bud Billings thousands of dollars, borrowed through Billings' WorldCo Financial. It seems Tice wrote "worthless" checks to Billings totaling more than $10,000 to Billings. When Hispanic American closed, Tice said the man inferred he had gotten the money from cousins in Atlanta in the Mexican restaurant business who were "members of the Mexican mafia." Tice said he still owes the "employee" $1500 and he has missed two payments this month. Byrd Billings' civil lawsuit against Tice is still pending. NOTE: All major updates are first added to THIS original post on the Billings murders, and then added to other relevant articles about the case.